Website and processes: 13 Apr 16 Martin, 5/5 Excellent "Excellent website, easy to use and a great choice of activities, will use again"
Experience the thrill of Paragliding Aerobatics with an expert pilot at the controls. We'll gain height using nature's lift and then enjoy our altitude with some high-g aerobatic maneouvers. 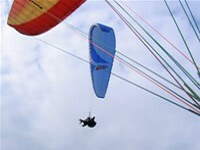 You will receive a voucher for a Tandem Paraglider flight valid for 6 months. You then ring up to book a date to fly. The pilots will provide you with a weather assesment the evening before (all aviation is weather dependent; if the forecast is unsuitable we'll re-schedule.) We'll meet at the most suitable launch site for the day and begin with a quick safety briefing and become day members of the British Hang Gliding and Paragliding Association (included). You'll be provided with a helmet and a flying suit and gloves if it's cold. We begin with a briefing about the launch, flight and landing procedures and go on to reherse the launch. Then we're airbourne! Within a couple of paces you can sit back in comfort and enjoy the view as we climb, take pictures and chat with the pilot. When we've gained sufficient altitude, we can enjoy burning it off with some exciting high-g aerobatic meneouvers. Age limits: 14 years minimum, with written parental consent if under 18. Maximum weight: 100kg People with disabilities can often fly with us, please call to discuss.